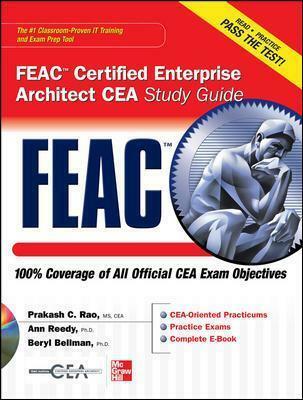 The best fully integrated study system availableFilled with practice questions, examples, and illustrations, FEAC Certified Enterprise Architect CEA Study Guide covers what you need to know-and shows you how to prepare-for this challenging exam. Prakash Rao, CEA, is Vice President and Chief Architect with Metadata Management Corporation Ltd., and a faculty member with the FEAC Institute where he teaches enterprise architecture and the DoD Architecture Framework. He is co-chair of the Association of Open Group Enterprise Architects, Washington Metropolitan Area Chapter. Beryl Bellman, Ph.D, is co-founder and Academic Director of the FEAC Institute and is a tenured Professor of Communication Studies at California State University at Los Angeles. He has consulted in enterprise architecture in the public sector and for the U.S. Departments of Defense, Agriculture, Forest Service, Energy, and Justice/INS, and the Executive Office of the President. Ann Reedy is a Ph.D. in Computer Science with extensive experience in academia and in the contractor community. After working with analyst support systems and software development environments, she worked on the C4ISR Architecture Framework, the precursor to the DoD Architecture Framework (DoDAF). She has supported the adaptation of the DoD Architecture Framework for various federal organizations and agencies as well as supporting startup enterprise architecture developments based on the DoD Architecture Framework. She currently teaches for the Federated Enterprise Architecture Certification (FEAC) Institute and continues to work part-time for the MITRE Corporation.